Herculaneum is a sister-site to Pompeii; a Roman town buried by the same eruption of Vesuvius which destroyed the larger Pompeii. Partly lying under the modern Naples suburb of Ercolano, the site of Herculaneum hasn't been fully uncovered and is much smaller and more manageable to visit than Pompeii. Destroyed in a different way, by a pyroclastic surge which killed inhabitants, carbonised wood and left the city buried under 16-25 metres of rock, the archaeological site offers a different kind of insight into the Roman world. Here you'll still see preserved wooden lofts, wine racks and bedsteads. Most of the furniture - from a baby's cot to household shrines - is now conserved in storerooms, but a few pieces remain on the site to give an evocative impression of Roman life. 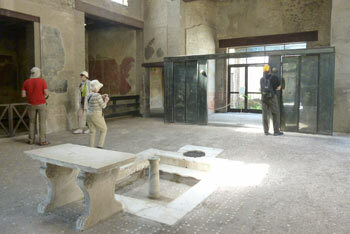 Many visitors prefer a visit to Herculaneum to a tour of Pompeii. The two archaeological sites are complementary and are both rewarding to visit, in different ways. I'd suggest visiting them over two days, along with a visit to the palatial ruined Villa Oplontis, nearby. Although it would just about be possible to visit both Herculaneum and Pompeii on the same day, I'd advise against it: you'll be rushed and won't be able to take everything in. The site is included in the UNESCO heritage listing "Archaeological Areas of Pompeii, Herculaneum, and Torre Annunziata". When Vesuvius erupted in AD79, towns, villas and farms around the volcano were destroyed. Pompeii was buried under a layer of ash and pumice which was thinner than the covering over Herculaneum, and some of its residents (or looters) returned after the eruption to salvage valuables and sculptures. Herculaneum was preserved exactly as it was, and the different nature of its destruction has made it fascinating for archaeologists and for visitors. Discoveries of organic matter, of fruit, bread, wooden furnishings, writing tablets, upper floors, and even the contents of sewers, has helped with an understanding of Roman lifestyles and buildings. Herculaneum is thought to have been a relatively well-off small coastal town, quite different to the bigger, urban and more 'ordinary' Pompeii. Herculaneum is much easier to explore than Pompeii. The archaeological site covers a small grid of streets, so it's simple to cover these in a methodical fashion and keep track of what you've seen so far. Practical advice on preparing for a visit and getting to the site can be found below. From the ticket office, looking over the ruins, the nearest part below consists of round arches which were once on the seashore and would have been used for storing goods or boats. This is a good place to start your tour; a ramped passageway leads down and emerges by the arched vaults. When these arches were excavated in the 1980s, archaeologists discovered what had happened to part of Herculaneum's population. On the ancient beach and sheltered in the vaults were three hundred skeletons. Most of those under the arches were women and children, with male skeletons found on the shore outside. Perhaps they were sheltering or perhaps waiting for a deliverance which never came. Some of these bones are still preserved in-situ and are a poignant way to begin your exploration of a town whose life was cut off so suddenly on a summer's day. Once you've entered the ancient streets, as long as you have time I'd suggest just working your way around from one side of the site to the other. The site is basically composed of three streets heading north-east to south-west (at right angles to the seashore arches), with two streets crossing them. If you are in a hurry, there is a cluster of important and characteristic buildings towards the far end of the central street, and in the block which is then on your left. There are a number of highlights to look out for at Herculaneum, and if you are feeling studious, a bit of advance preparation will give you the chance to compile your own personal list of must-sees. The BBC made an excellent 2013 documentary with Herculaneum expert Andrew Wallace-Hadrill called The Other Pompeii: Life and Death in Herculaneum (available on BBC iPlayer if it's been repeated recently, otherwise try YouTube or buy from Amazon ) which makes a good primer before a visit. Buildings at Herculaneum are labelled with a number and a name in Italian, which you can then look up using the site guide booklet or audio-guide. General features to look out for as you explore include the chances to see wooden upper floors, parts of decorative ceilings and wooden fittings such as racks for wine amphorae. Several handsome public water fountains, consisting of a tap hole, sculpted decorations and a trough, give an idea of the city's practicalities and the civic pride its residents may have felt. On the central street (Cardo IV) a sign hanging between two buildings marks out the properties' boundaries and owners. You can peer into shops, bars and bakeries and sometimes enter them; big stone vases set into worktops would have contained the food served up to customers who in Roman times would have obtained many of their meals out of the home. Many of the grander dwellings in the town had shops built into their street-facing façades, but once inside you enter a far more refined world where an imposing atrium or courtyard might be ornamented with a central pool, paintings around the walls and mosaics on the floor. The surviving exterior doesn't always give a clue as to what treasures may remain inside, so poke around in all the buildings you have time to enter. - Hall of the Augustales (Sede degli Augustali). A meeting hall for the priests of the Emperor Augustus, who were usually ex-slaves, decorated with remarkable surviving frescoes. Lofty and atmospheric. - House of Neptune and Amphitrite (Casa di Nettuno e Anfitrite). This house has a wine shop outside with a wooden balcony, a screen and a rack for amphorae. In the residential dwelling behind, a dining area is decorated with beautiful wall mosaics including a famous image of Neptune and a nymph. Details of this were painted with gold. - House of the Wooden Screen (Casa del Tramezzo di Legno). A grand house with a high-ceilinged atrium containing a marble basin to catch rainwater falling through the 'skylight' in the ceiling, and a reception area which could be closed off using a wooden screen; a remarkable survival. It's a great glimpse into how the rich might actually have lived in their homes. Frescoes depict birds, vines, grapes and architectural fantasies. A bed or couch survives in a small adjoining room to add to the picture. - House of the Black Room/Salon (Casa del Salone Nero). This luxurious house boasts a little courtyard garden, mosaic flooring and very fine wall paintings on a rather unusual black background, showing the variety of art favoured by Herculaneum's inhabitants. 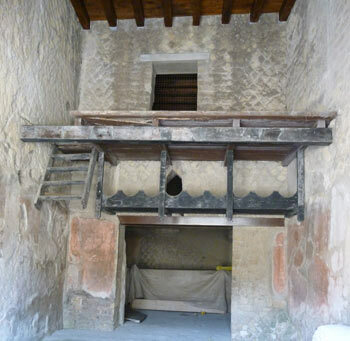 The house is also evidence of the social mobility which was sometimes possible in Roman society; it is known to have belonged to a former slave who achieved the status of a Roman citizen. - Cucumas's shop (Bottega ad Cucumas). Cucumas's shop, or inn, bears a wall painting by its entrance which announces the prices of pitchers of wine, along with illustrations. - Women's baths (Terme Femminili). Humbler than the men's baths next door, but still elegantly decorated with a nautical floor mosaic, marble pool and marble benches. - Details such as shops, water fountains, grand doorways and lead pipes for the water supply will help give an idea of everyday life on the streets. At any given time, certain buildings will be closed to the public. A list is available online and at the ticket desk. So, as with Italy in general, it's best to approach Herculaneum with a positive attitude and get what you can from a visit while being prepared for possible frustrations. The famous Villa of the Papyri next door is unlikely to be open; this was where papyrus scrolls from an extensive library were dug up, along with a sculpture collection now in the archaeological museum in Naples. Herculaneum is open every day except 1 May, 25 December and 1 January. Opening hours are 8:30am-5pm between November and March and 8:30am-7:30pm April to September. Last admission is an hour and half before closing time. I'd strongly advise visiting the official Pompeii Sites website (see right-hand links panel) where you can check the latest opening times, prices and discounts, download advance information (more below) and also view the list of ruins which are currently closed to the public. 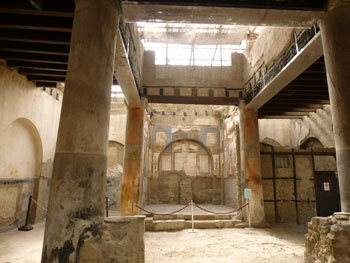 There is a choice of combined tickets for visiting Herculaneum and its sister sites. A ticket for Herculaneum alone costs €11 at the time of writing. The Pompeii sites (including Villa Oplontis, Pompeii and a couple of others) can be seen on a joint ticket for €22. Tickets can be booked online in advance. Check reductions for different age groups (e.g. 18-25) and Italian cultural initiatives for occasional free entry. 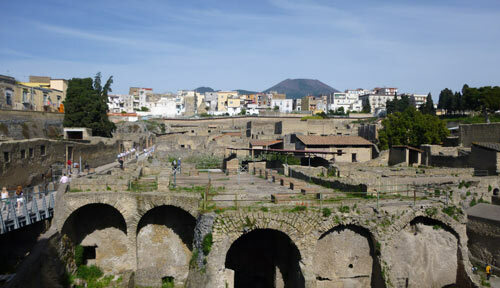 Herculaneum is one of the free sites you can visit with a Campania Arte Card. In theory, a map and an informative pamphlet should be available at the ticket desk. However, when I visited there were no pamphlets available and maps were only being handed out with the expensive audio-guide. I'd suggest downloading the useful information booklet in advance, and printing a map (see links panel, or look for "Maps and guide" on the official website). As well as being prepared for the cultural aspects of the visit, it's a good idea to plan ahead and take water to drink and sun protection. The archaeological site is ten-fifteen minutes' walk from the Ercolano Scavi station of the Circumvesuviana train which runs from Naples to Sorrento (scavi means excavations in Italian). From Napoli Garibaldi the journey takes seventeen minutes, and from Sorrento the travelling time is forty-eight minutes. If you time your travel to catch one of the rarer trains with limited stops, you can knock a few minutes off the journey. The trains fill up with tourists at Napoli Garibaldi so if you want a seat, you can try boarding at the Naples terminus, nearby Porta Nolana. At the time of writing a new, comfortable tourist express train called the Campania Express also runs between Naples, the Vesuvius sites and Sorrento, though this is more expensive. Outside Ercolano Scavi station, walk a short way to the right to join the main road leading straight down towards the sea. Follow this road, crossing over a roundabout and continuing straight ahead down Via IV Novembre. At the end of the road is an archway leading to the archaeological site. There is very much a sense as you approach the site that Ercolano has been receiving tourists visiting its ruins for hundreds of years. Along the route you'll find a choice of places to eat, drink and buy snacks, all very prepared for overseas visitors. After heading through the gateway the route to the entrance lies down a walkway with a great view over the archaeological site. This makes it clear how deeply the Roman town was buried and gives an idea of how it extends under the modern suburb. The ticket office lies at the end of the sloping path. There are a couple of toilets here, and more inside the site. Through the ticket turnstiles, the access path leads along the seaward side of the site to a little building complex with a bookshop, audio-guide sales, toilets and a cafe with outside tables. Here is the actual entrance to the ruins. I'd recommend allowing two hours or more for touring the site, though you could see highlights in less. Although I wouldn't suggest combining Herculaneum with Pompeii (which covers a much larger area) unless you are really, really energetic and keen, it does work well in a day out with Villa Oplontis. The most popular bases for a holiday including visits to the Pompeiian/Vesuvian sites are Naples - for a bustling city stay - and Sorrento - for an enjoyable holiday atmosphere. Some visitors, touring, choose to stay overnight in modern Pompei, which would be a practical option for combining the Roman sites over two days. 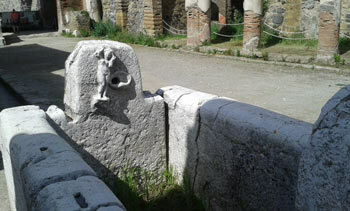 Ercolano itself offers several choices. The nearest to the ruins is Hotel Herculaneum. Pompeii and Herculaneum are the obvious Roman sites in the Vesuvius area. Villa Oplontis, also on the Circumvesuviana railway line and close to Pompeii, was a palatial Roman seaside villa which was partially destroyed by the eruption, and now makes a remarkable place to visit without the crowds of the two buried cities. The archaeological museum in Naples is unmissable if you've an interest in history and want to see the best discoveries from Pompeii and Herculaneum. Close to Sorrento, the Villa di Pollio Felice is very ruinous but has a breathtaking location on the sea's edge; it's also worth a visit if you're staying in Sorrento.